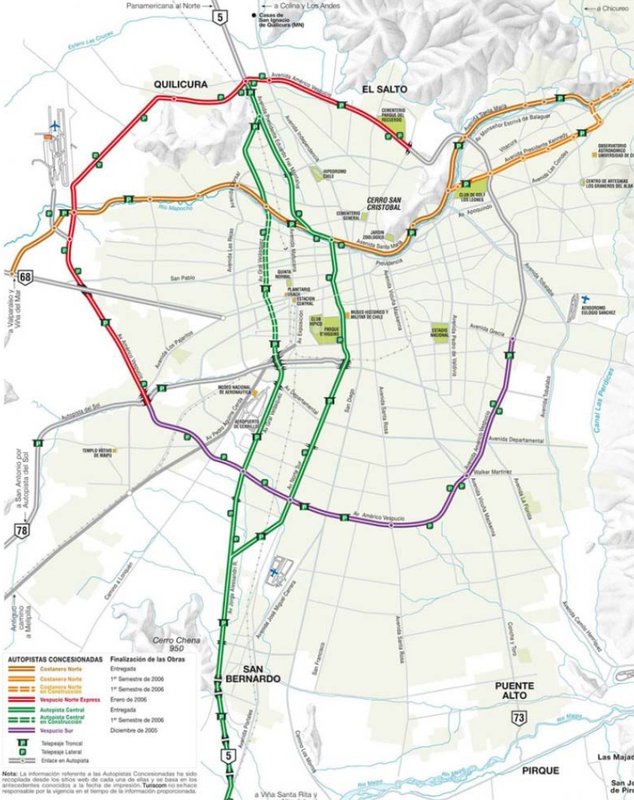 El área metropolitana de Santiago de Chile cuenta con más de 5 millones de habitantes, configurando el mayor núcleo urbano del país. – Un aumento sostenido de los ingresos, con un patrón sin cambios de distribución social. – Reforma reciente del sistema de autobuses. According to an article by Oscar Figueroa on planeo.iet.cl, during the last decade 250 km of new urban highways have been built in the metropolitan area under concession to private operators and a toll system. Each highway is subject to a specific and distinct concession contract. Highway exchanges are sometimes deficient (Costanera Norte with Autopista Central, Vespucio Sur with Autopista Central), and an inadequate transversal section of in the poorer areas of the city create permeability problems for the inhabitants, that sometimes risk their lives crossing the traffic lanes as the overpasses are not enough. The toll system allows an increase in capacity but focusing the cost on direct users, a positive step.